With Rosh Hashana just a couple days away I should really be planning a menu, going shopping doing some cooking and at least sharing some of the pictures of with all of you. I actually didn't even get started yet. My menu will be figured out after Shabbos and all of my shopping will get done Sunday morning. I will then spend the rest of the day in the kitchen preparing everything that's needed. This is what I do every erev Yom Tov. One day when I have a house full of children and hopefully many guests, I will have to do this kind of thing in ahead of time but for now I find that this works well for me. So I don't have much to share for holiday cooking right now, but I can give you the recipe for this delicious fettuccini alfredo with an interesting twist that we had this week. As always I am now on the hunt for some food inspiration for preparing the perfect Yom Tov dishes. 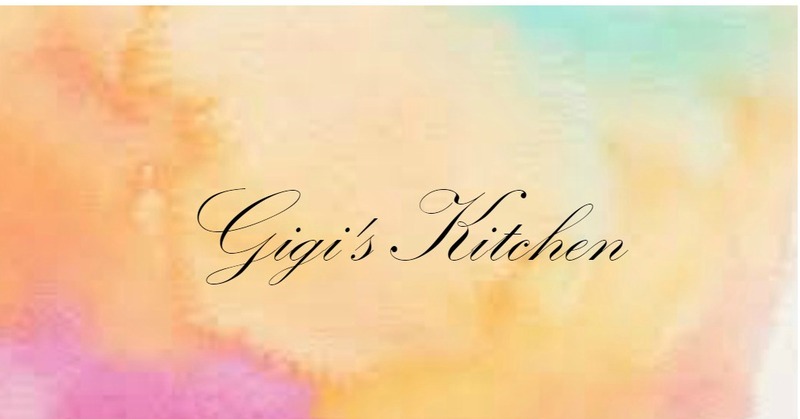 Please feel free to share some of your pictures and recipes with me! I will try to get some sort of post up with my delicious finds along with their links pretty soon so that if you are either last minute on the prep like me or just need a couple of last touches to add to what you've already done, I can hopefully inspire you. 1. Start by cutting up all of the raw salmon into small cubes. Place it in a container with the lemon juice along with a sprinkle of salt and pepper. Toss it to ensure it all gets completely coated. Then place in the refrigerator to marinate until ready to cook. 3. Slice up the red onion into small pieces and put them in a non stick saute pan and sprinkle brown sugar over top of them. Top that with the salmon pieces along with the lemon juice it was marinating in. Heat it up over a low-medium flame allowing the salmon to cook up and for the onions to caramelize nicely. Stir constantly. Make sure that the salmon is no longer pink on the inside but still a little moist indicating that it is cooked through perfectly. 4. Prepare the cream sauce. Melt the butter stirring it over a low flame in a small sauce pan. Add the fresh garlic letting it cook a little bit. Then add the heavy cream and parmesan cheese. Stir the sauce as it bubbles and thickens. 5. Last put the dish together and serve. Lay the pasta out on the plate first. Then spoon about 5-6 tablespoons of the cream sauce over top of it, making sure to spread it evenly over all of the pasta. 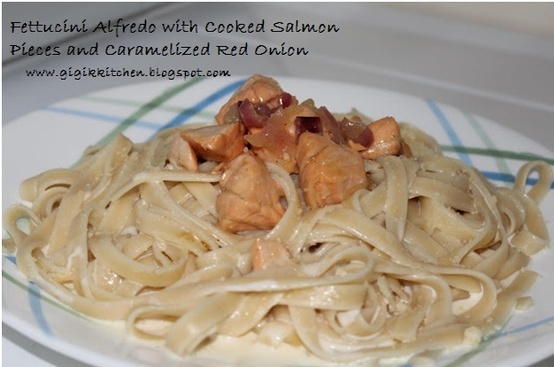 Top it with the pieces of cooked salmon, caramelized red onion and whatever sauce comes along with it. Serve right away immediately after topping the pasta with everything else. 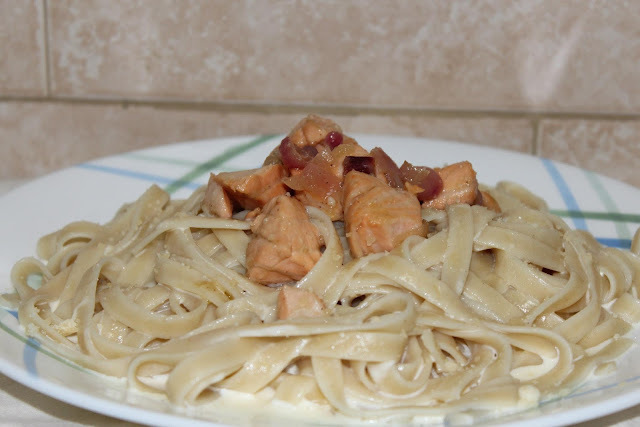 If you don't want to serve right away keep the pasta separate from the sauce, salmon and onions until ready to serve. I hope you will try this recipe, it was absolutely divine. I like preparing a regular fettucini alfredo pretty often but this definitely was a nice spin on that idea.